Allies of Nigeria's ailing president forged his signature on the country's supplementary budget last month, opposition politicians have alleged. They have written to the police asking them to investigate the forgery claims. The government said President Umaru Yar'Adua signed the budget despite being treated for a heart condition in Saudi Arabia. 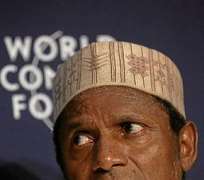 Mr Yar'Adua has been away for six weeks, fuelling fears of a power vacuum in Africa's most populous nation. Several court cases have been launched demanding that power be officially handed to the vice-president. And one group of activists has even suggested the president should be declared a missing person, and a search party should be sent out. In the latest move, an umbrella group for the main opposition parties known as the Conference of Nigerian Political Parties (CNPP) has demanded that the police investigate the alleged forgery. The group's lawyer, opposition official Femi Falana, said in the letter that the CNPP had tried to verify claims by the government that the budget had been taken to Saudi Arabia for the president to sign on his sick bed. "To its utter dismay our client (CNPP) has confirmed that the signature of the president and the seal of the Federal Republic of Nigeria were forged by some persons in the presidency," the letter read. "Our client has instructed us to request you to use your good offices to set the engine in motion for the investigation and prosecution of those who carried out the nefarious act." The CNPP said it would take the issue to the federal court next week if the police failed to act. Mr Falana, who is also senior opposition activist, is behind one of the court cases being brought against the government. He wants judges to annul all decisions taken by the cabinet during the president's absence. In the other cases, one activist wants Mr Yar'Adua to be sacked because of his ill health and the Nigerian Bar Association is demanding that power be handed over to Vice-President Goodluck Jonathan. The courts have asked for the three cases to be merged, and the consolidated case is due to be heard next week.